Join us every month on the night of the full moon from 7:15 - 8:00 pm and celebrate beginnings, endings and everything in between. 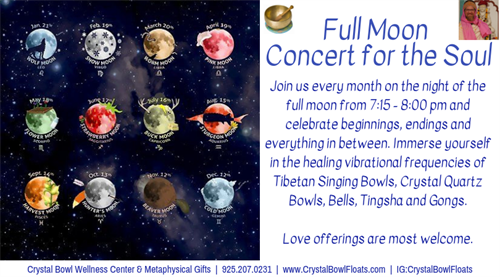 Immerse yourself in the healing vibrational frequencies of Tibetan Singing Bowls, Crystal Quartz Bowls, Bells, Tingsha and Gongs. Love offerings are most welcome.